A couple of small releases from way earlier in this year I feel should definitely be checked out! Hiding is so Futile is the debut demo from this Serbian 3 piece which I found while looking through related artists for Satan’s Satyrs. 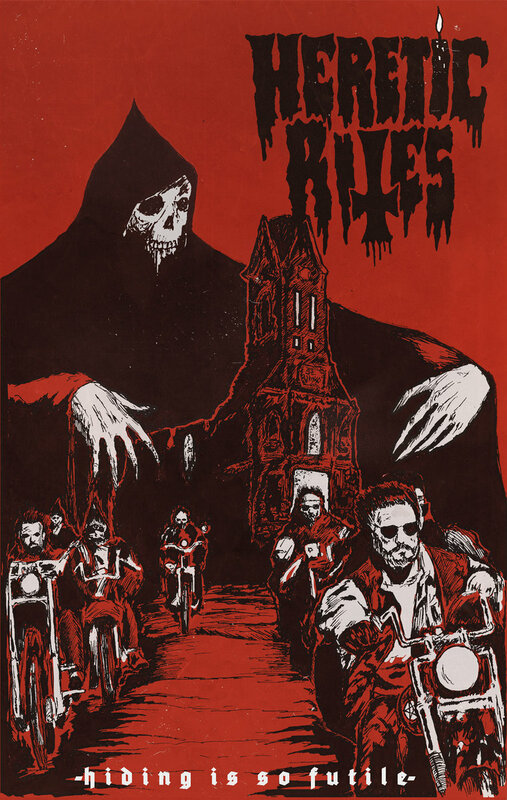 While Heretic Rites have a very similar 60’s occult and biker aesthetic to Satan’s Satyrs, unlike SS’s biker/doom/punk mix on the debut, they’ve ramped up the Electric Wizard styled doom metal and thrown it in with a more occult rock vibe. The 4 songs here are dark, foreboding and quite drawn out despite being of around 4-7 min long each; especially so on the 7:30 minute closer, Beneath the Chapel which opens up in a dirge paced doom section before hitting off with occult rock swagger . The vocals are pretty much dead on the exact vocal style from Salem’s Pot with their space-y reverb soaked and drawn out wails, which can be a bit jarring when the music hits its more energetic sections. The production quality is actually pretty good for a demo, sounding more like an EP than anything else. Definitely worth hitting up even if the wailing vocals become a bit jarring of a contrast to the instrumentation at times. Despite this EP coming to my attention in the latter half of this year, it was released smack bang on the 1st of Jan and has generally flown under the radar since then. Which is a damn shame really because this EP is four killer tracks of psych/hard rock featuring fuzz drench riffage, hypnotic drumming and some very catchy song writing, both instrumentally and vocally. While the vocals are primarily female, the second track, Temples, features male and female harmonising, which tied in with the leads used creates an interesting occult-ish sounding psych hypnosis. The ending track, Miserere, features a creepy, gothic sounding synth riding underneath ominous riffs and an occult-ish vocal delivery, which is definitely a great ending to the EP. For name your price you’d be thick to give this a miss!